http://www.landmarks.org/ten_most_2013_community_mausoleums.htm, a statewide partner of the National Trust for Historic Preservation, named ‘community mausoleums’ to their list of ten most endangered historic places, a list compiled every year since 1995. Although dozens of applications are received each year, only ten make the annual list. “It is a great achievement for the Beecher Mausoleum to be included in the state’s top ten endangered list,” said Sandra Lee Thielman, president of the Beecher Mausoleum Association, the management board overseeing the mausoleum and the Guardian Angels not-for-profit organization, established to restore and preserve the site. The Beecher Mausoleum was one of two mausoleums specifically highlighted by Landmarks Illinois to represent the community mausoleum category. The other was the Fernwood Mausoleum in Roodhouse, Green County, Illinois. The two are representative of between an estimated 50 and 100 mausoleums across the state of Illinois that may also be in peril. Beecher’s mausoleum was built during the height of the community mausoleum movement in the early part of the 20th century. Constructed in 1913, the Beecher Mausoleum was designed by Cecil Bryan, a renowned Chicago architect and engineer who once worked with Frank Lloyd Wright. The neoclassical building is made of reinforced concrete with a Bedford stone veneer and white marble interior. 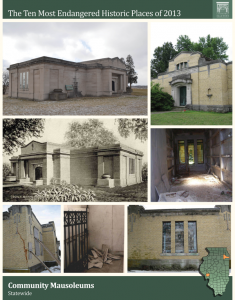 Over the years, the Beecher Mausoleum has shared the same fate as many other community mausoleums across the country. Management boards and funds for support and maintenance have long been exhausted. Repeated vandalism has taken its toll. The future of the Beecher Mausoleum remains uncertain. Despite being named for Beecher, the building is located outside Beecher’s village limits. St, Luke’s Cemetery is adjacent to the mausoleum, but has no affiliation with it. Consequently, neither bears legal responsibility for the mausoleum. Recognition by Landmarks Illinois culminates a 17-year effort led by Thielman to restore and perpetually care for the building that houses three generations of her family. Many other prominent citizens and founding fathers of the Village of Beecher and Washington Township, are also interred there, along with many veterans from the Civil War as well as World Wars I and II. Thielman has learned of many problems statewide similar to those in Beecher. Her request for assistance from Landmarks Illinois is not limited to Beecher’s Mausoleum, but for all neglected and abandoned cemeteries and mausoleums in Illinois. To commemorate Memorial Day, an open house will be held at the Beecher Mausoleum from noon to 4 p.m. on Sunday, May 26 and Monday, May 27. This entry was posted in Automated Article Listing, Historical Information, Newspaper Articles, Statistics by Sandra. Bookmark the permalink.